This time of year always makes me want more Mexican and Spanish food. The food I grew up eating. I was thinking about it, and because I grew up in a Mexican and Spanish home, it makes sense to crave that food. Where as if you grew up eating pot roast and prime rib for the holidays, you probably crave that right? With holidays, family memories and food traditions seem to come about in our holiday meals, and it’s no different in our household. I was just talking with my family this week about what we will be serving for Christmas and New Years this year, to no surprise, we chose all Mexican and Spanish dishes. Just like we do every year. I think one year I made a lamb roast, and prime rib. I love both of those dishes, but I would prefer something a bit more traditionally Mexican. Not only do we need the main meals but being with family, and having visitors we need one pot easy breezy meals for around the holidays. Since this year we aren’t hosting man people, I wanted to make something even more simple and easy so we can do more in the way of games, puzzles, fires, and reading. Since my Dad is here, I wanted to make something we would all love and take comfort in enjoying as a family. We all love a big pot of beans, tamales, and good salsa. I mean, who doesn’t! I got to thinking, I don’t make tamales very often, gasp! But I do love the tamales crust, so it came to me, this dish. I mixed together a can of Bush’s black beans, new from there Latina influenced line, Cocina Latina. Which means Latina Kitchen. They are so good, and have different flavors that remind me of eating my Mamas beans with bacon and chiles. They are really good. Why not make a tamales with out having to make tamales? Genius. I mashed the beans in with chicken, one extra poblano, sweetpotatoes for a our good health, salsa, and topped it off with that beloved tamale crust. Not to mention, pile on the comforting flavors of Mexican cheese, sour creams, green onions, and more salsa. Yes please one thousand times over! My family was as happy as any other Mexican family eating tamales. Happy bellies all around and no time making this meal equals a happy me. With traditions being so important to Latinos, it’s nice to have companies recognize that and make a quality product that we can use to make our traditional type meals a bit easier. 1. In a large bowl combine masa harina, salt, melted butter, and milk, using a spatula or hands, mix to combine. Cover and allow to rest while preparing pie filling. 2. In a 10 inch skillet or oven safe pyrex, or baking dish, add black beans, chicken, salsa, cheese, sweetpotato, and Poblano pepper, mix to combine using a large spoon. Note for tamale crust: The easiest way to roll this out is to place masa on a cutting board lined with parchment paper or plastic wrap, and very gently without pressing down to much, roll out to a 11 inch circle. Pick up parchment or plastic wrap and turn over onto the pan with pie filling. Fix corners and tuck into sides without too much dough hanging over edges. 3. Place pan on parchment lined baking sheet to avoid spillage onto bottom of oven, and cook for 45 minutes, or until tamale crust is crispy an golden brown. 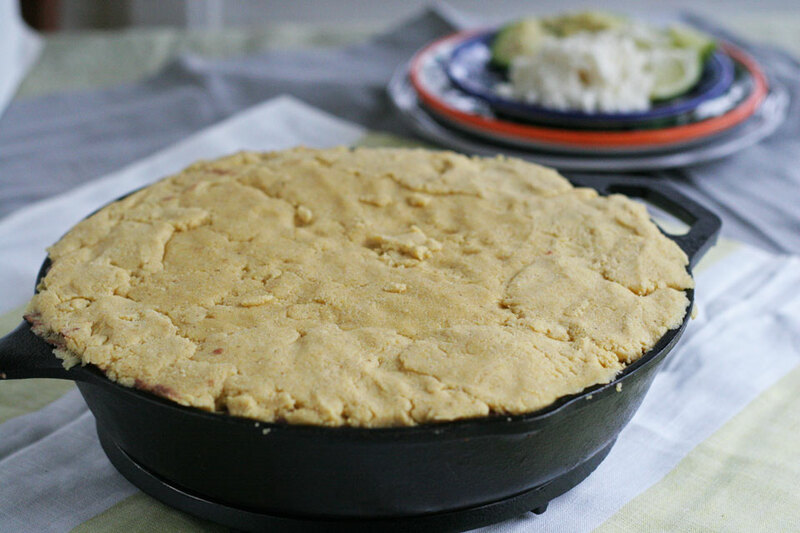 This tamale pie looks wonderful and easy to make too! I can’t wait to make it! WOW This looks fantastic! I’ve never had anything like this. Dying to try it now! Love – an easier way to make tamales for everyone! Thank you, Marnely! I love tamales obviously, but I need a quick fix. 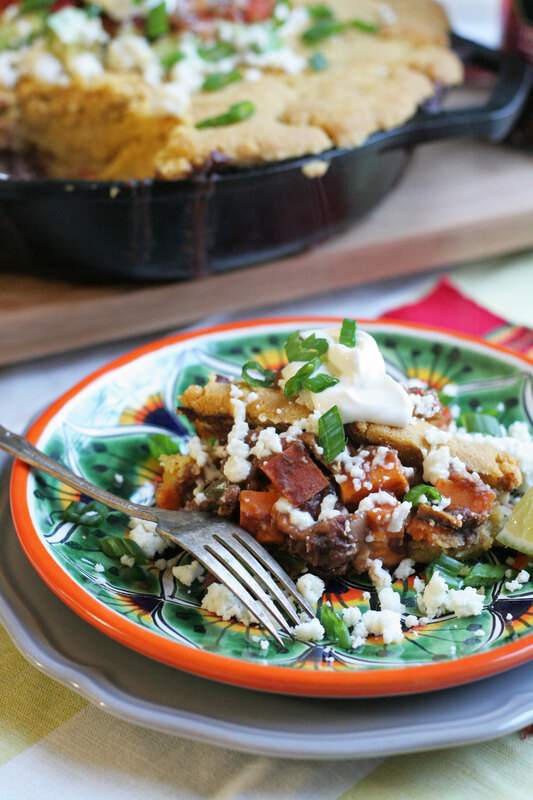 My family loves Mexican style dinners and I know they would love that tamale pie. I love other people’s holiday traditions. I grew up eating French Canadian Tourtiere! Your pie looks amazing. 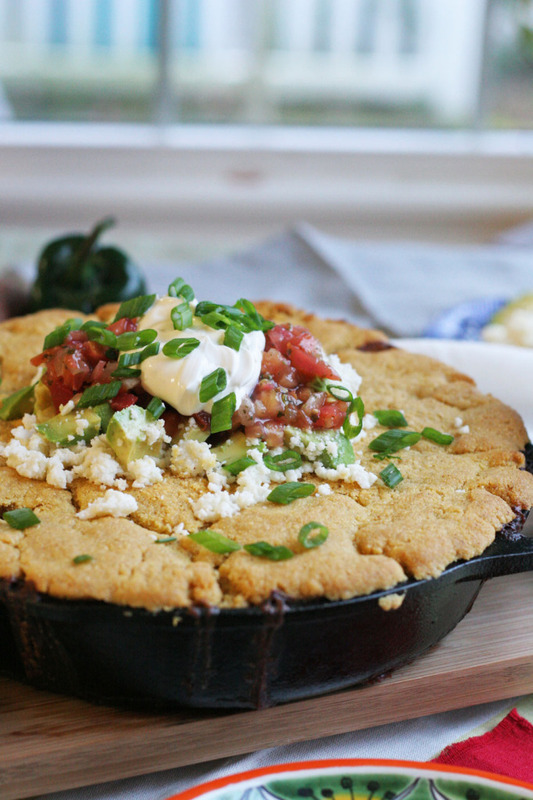 This tamale pie sounds incredible!! We love tamales, and this is such a great way to make them!